Most archaeologists agree that people have lived amongst the Emerald Isle for more than 9,000 years, which means Ireland is absolutely bursting with cultural history valuable to all of humankind. Perhaps that is why UNESCO (United Nations Educational, Scientific, and Cultural Organization) has seen fit to award the coveted designation of World Heritage Site to no fewer than three distinct locations on the tiny island — and the organization is considering adding at least three more to its list of protected sites. To understand the hype, you may want to plan a trip to Ireland to see these six outstanding Irish sites worthy of such high cultural and historical significance. Brú na Bóinne, or Newgrange in English, is a massive earthworks in County Meath that is one of the British Isles’ most recognizable and significant New Stone Age sites, and thus well-deserved of its UNESCO title. More than 5,000 years old (about 1,200 years older than Stonehenge) and cumulatively weighing about 200,000 tons, the earthworks take the form of a giant circular cairn, surrounded by walls of white quartz and granite. Many of the stones inside and out are intricately carved with designs and stylized figures; indeed, the site is recognized as one of the prime examples of what Neolithic artists could achieve. 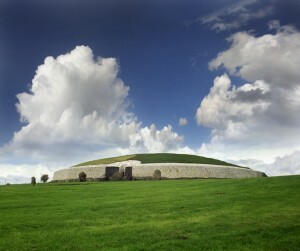 Archaeologists can’t say exactly what the intended purpose of Newgrange was, but it is clear that the site was used for innumerable functions (including social, religious, and funerary) by the countless civilizations who lived in this region of Ireland. Just west of Iveragh Peninsula, about seven miles into the Atlantic Ocean, lay two tiny islands, the larger of which contains the remains of what was once a thriving community of ascetic monks. Sometime between the 6th and 8th centuries, a small group of no more than 12 monks build two stone oratories in which they could live and cultivate a greater relationship with God. 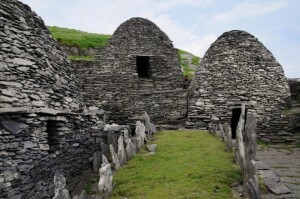 For more than five centuries, the monks of Skellig Michael were alone and self-sufficient. In truth, it is easy to feel the powerful spirituality of the place, which is still quite removed from the hustle and bustle of modern civilization. Visitors can reach Skellig Michael through boat tour operators, but access is strictly regulated to keep the UNESCO site clean and erect. Unlike the previous two sites, which are culturally significant due to the effort and creativity of previous peoples, the Giant’s Causeway is noteworthy for its astounding natural beauty. On the beautiful Antrim Coast, the causeway stands out as 40,000 interlocking basalt columns that look anything but nature-made. 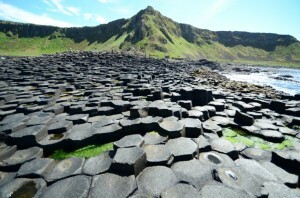 Legend states that an Irish giant challenged a Scottish giant to a duel, and thus they built the causeway across the channel in order to do battle; however, the truth is that substantial volcanic activity about 50 million years ago spread the basalt on both Irish and Scottish coasts, and when the basalt cooled, it cracked into the distinctive pattern we see today. Technically, Giant’s Causeway is a UNESCO site in County Antrim, Northern Ireland, which means it is property of the United Kingdom. However, visitors can still make the trek to the causeway and stay on budget by flying to Belfast from Dublin through Flights.com. Céide Fields may look like a barren series of flat hills, but it is in truth a treasure trove for information about Neolithic peoples. Indeed, the hills and valleys are the most extensive Stone Age site in the world, offering the oldest cultivated field system currently discovered, reaching back more than 5,700 years. Archaeologists are campaigning to make the site UNESCO-certified for its significance in Neolithic studies. According to legend, the Hill of Tara was once the seat of the High King of Ireland, who protected all of Ireland and its peoples from various threats. As such, the hill is home to a number of impressive ancient monuments. One of the most iconic is a circular earthworks fort which features at its center a standing stone known as the Stone of Destiny. It is said that the stone oversaw the coronations of all of Ireland’s kings, which makes the site particularly important to the island’s cultural history. Any visitor to Ireland would be remiss to avoid the thriving capital of Dublin, but beneath its modern exterior lies a majestic, timeworn city that was the second most important in the British Empire during the Georgian period. Historic Dublin’s buildings are elaborately decorative, designed by Ireland’s top artisans for Britain’s wealthiest aristocrats. Ultimately, the gorgeous city attracted hordes of artists, including Nobel-winning writers like Yeats, Shaw, and Becket.